Pashupatinath temple( (पशुपतिनाथ मन्दिर) is the biggest and most visited temple of lord shiva in the world. Pashupatinath is the most consecrated place in Nepal which is situated to the eastern part of the city in Kathmandu Valley. Pashupatinath means the ‘Lord of animals’. The Lord Shiv himself is the God named Pashupatinath. One interesting story has been associated in describing how the God Shiv became Lord of animals. Many years ago God Shiv was devastated by the death of his wife Sati. He was bereaved by the tragedy that has fallen upon him. Being frustrated by the demise of his wife, he left Kailashkut and headed to the earth. He saw a beautiful jungle and hills. With the desire to console himself and lessen all those suffering and pain he changed into a deer. He started to live in the serenity of the jungle. However, the God’s abode or the place of deity was threatened by the demons. The group of Gods arrived to this jungle in search of Shiv. With their vision, they recognize the God Shiv disguising in the form of a deer. They grasped the deer and pulled him by the horn. While pulling and pressuring the deer to move, the horn was broken. The broken horn remained in the jungle. Most surprisingly, a kamadhenu (cow which always gives milk) always poured the milk in the same place. This act of the cow continued for a long time which made cow shepherd search about the reason. One day they followed the cow and saw that it was showering its milk on the soil. The group of shepherd dug the place and happened to find a white horn underneath. Since then it was worshipped with reverence and creed that it was the horn of the deer which was the form of Lord Shiv. The tradition of venerating the place with the name of Pashupatinath and the asking for the blessing of the God Shiv has been continuing to this date. This is the same place where a temple of Pashupatinath has been erected. The time, when Pashupatinath Temple was first erected, has not been confirmed. However, the Lichhavi King Supushpa Deva has been regarded as the King who constructed the two-storey temple of Pashupatinath. As far as history is concerned, the period of King Supushpa Deva dates back to 39 generation before the time of King Manadev, who lived since 464-505 AD. 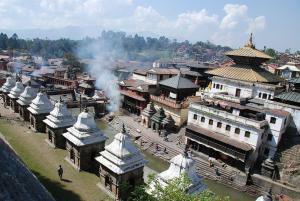 The history of Pashupatinath dates back to 400 BC. Nevertheless, the exact date of existence has not been confirmed with evidence. More than anything else this has been considered as the holiest place of Nepal and the most privileged religious temple for Hindu people from all around the world. The number of people exceeds more than 7, 00,000 on the day of the most celebrated festivals named Maha Shiv Ratri in this temple. Pilgrims and devotees especially from India and different parts of Nepal arrive here to celebrate the night of Lord Shiv. The free access and use of marijuana on this date allures smoke enthusiasts and Sadhus who are covered with ashes on their half-naked to full naked body. They are supposed to be the fervent follower of God Shiv. The smoke they do is regarded as the smoking habit of God Shiv. Indeed, the symbolism of smoking by God Shiv insinuates that God Shiv had the power to control the negativity as well as the positivity in the life. Both negative and positive traits are inherited with every person. The better way is to decrease the bad habit by keeping inside and nulling down it and increasing the positivity. The setting of Pashupatinath Temple has heightened by its location at the bank of Bagmati River. The water flowed beside the temple elaborate the beauty of the temple. The entrance of Pashupatinath temple is possible from West Gate or the South Gate. You keep your shoes off if you want to enter inside the temple. The tradition of the temple is that only Hindu followers are allowed to enter from the main gate of Pashupatinath Temple. In spite of such regulation you can see the complex of the temple from outside and also can take the photos. Inside the temple no camera is allowed. As a visitor you would enjoy seeing the people and their devotion for the God. Your step towards the northern part of the temple arena allows you to overview the temple and its surrounding buildings. If you want more clear view of the temple, you can cross the bridge laid over the river between the Aryaghat (Cremation place) and Temple. Crossing the bridge you reach to the east part of the temple from where you can take the photo as well as experience the cremation culture and rituals of Hindu people. On the other you would also see the greenery jungle further towards the east. When you walk upstairs for few minutes you will see buildings of temples located at the top of the hill. In addition to the numerous temples you would also see the monkeys all around. Indeed, this is not the popular place to visit except on the occasion of Maha Shiv Ratri. It’s advisable to ask the security persons before you go to visit that area. Moreover, two other festivals named Bala Chaturthi and Teej are highly celebrated in this holy precinct of Pashupatinath Temple. On the occasion of these festivals especially Teej and Maha Shiv Ratri, women stay in line since 2 am in the morning and the turn comes late in the morning may be in the afternoon, if not in the evening. The queue spreads about 3 kilometers away from the gate of the temple. They are not supposed to drink and eat anything till they worship the God Shiv. Interesting! You may get the chance to observe yourself if you come to visit on the very occasion of these festivals. The Teej falls in August/ September and Maha Shiv Ratri falls on February/ March. On every Monday, the fasting women flock to worship the Pashupatinath. You would see the shops of garland, worshipping things, Rudraksha, coconut, crystal etc. are located on the western part of the Gate. You also see small shops when you exit from the South Gate and follow the path going further down to the south. When you return back from the eastern bank of the river, on your left you would see the old age home. Since 1979, Pashupatinath Temple has been inducted into the UNESCO World Heritage Site. Even though mega earthquake in April, 2015 damaged many property of the temple, the main temple remained intact.